Titanium is super strong, durable, highly-versatile and light-weight. With Virto B-Titanium, Phonak combines the benefits of titanium with the latest 3D printing technology. This results in the smallest custom device it has ever produced. Phonak is extending its Belong platform to the Bolero family of BTE hearing aids, including the new Virto™ B –Titanium. This announcement comes only six months after the celebrated global launch of the rechargeable Audéo B-R, broadening the Phonak industry-leading portfolio of rechargeable and super-discreet hearing solutions. The custom-made Virto B-Titanium is super-discreet when worn, making it the perfect solution for first-time hearing aid wearers. Because the titanium shell is half as thin as traditional shells, the overall size is reduced significantly, thus increasing invisible-in-the-canal (IIC) fit rate by 64%. This enables the tiny device to potentially fit patients with smaller ear canals who were not good candidates for IIC devices in the past. Virto B-Titanium and all Bolero B models including B-M, B-P, B-SP, and the rechargeable B-PR run on AutoSense OS, the operating system from Phonak. The updated version of the AutoSense OS analyzes sounds every 0.4 seconds and draws upon multiple features, blending them to create over 200 distinct settings to precisely match sound environments. 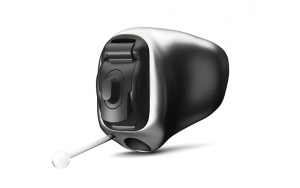 All this is done automatically, without any manual adjustments being made to the hearing aids. Recent studies2, 3 at the Phonak Audiology Research Center confirmed that AutoSense OS delivered better speech understanding over patients’ manual selection and unmatched hearing performance in everyday listening situations over two leading competitors. For more information on Phonak’s latest lithium-ion rechargeable hearing aids, please visit www.phonakpro.com/rechargeable or www.phonakpro.com/bolero-b. Additional information about the new Virto B-Titanium instrument can be found at www.phonakpro.com/virto-b-titanium. In 2017, Phonak, a member of the Sonova group, proudly celebrates its 70th anniversary! Headquartered near Zurich, Switzerland, Phonak was born in 1947 from a passion and dedication to take on the most difficult hearing challenges. Seventy years later, this passion remains.